This is the perfect recipe to make at the beginning of the week, as any leftovers can be used for packed lunches. It's ideal for picnics too, if the sun makes an early appearance. 1. Preheat the oven to 190ºC, gas mark 5. Shape the pastry into a disc and roll out on a lightly floured surface until large enough to line a deep, 23cm loose-bottomed tart tin. Trim the edges and prick the base with a fork. 2. Line the tart with a sheet of baking parchment and fill with baking beans. Bake for 15 minutes until pale golden. Remove the paper and beans, lower the oven temperature to 160ºC, gas mark 3, and cook for a further 5 minutes. 3. Meanwhile, cook the bacon in a non-stick frying pan for 4-5 minutes until crisp, then drain off any excess oil. 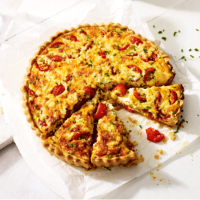 Place the tomatoes, cheese and bacon in the tart tin. 4. Beat together the cream, milk, eggs and chives, and pour into the case. Bake for 45 minutes until set and golden. Take the tart out of the tin, sprinkle over the extra chives, slice and serve with salad. Refrigerate leftovers for up to 2 days and enjoy hot or cold, or freeze for up to 1 month and defrost thoroughly before heating through.